Discover the principles, practices, and insider secrets of paid professional speaking success. You’ll get 77 instant-access “micro chapters” to help you market your smarts, monetize your message, and dramatically expand your reach and revenue as an expert speaker. For thought-leading CEOs, executives, consultants, and entrepreneurs, the true test of your personal brand comes down to one simple question: When you open your mouth, do people listen? Regardless of the speaking venue--in person, via livestream, in broadcast media, on podcasts, or at national conferences and industry events--the powerful articulation of your value, relevance, and impact is what makes experts stand out. But where do you start when you’re trying to build your speaking platform? Do It! Speaking shows you the inside track on marketing, positioning, packaging, prospecting, outreach, sales, and how to land more and better speaking gigs on behalf of your company, your brand, and yourself--without the marketing monkey work you hate. This book is the definitive guide on how to develop your speaking-driven revenue streams, and how to quickly commercialize your knowledge in today’s economy, which values thought leadership over pitches, hype, and ads. You’ll not only bolster your visibility, credibility, and bank account--you’ll also become a more effective messenger of your company’s message and dominate your marketplace. Acquista Do It! 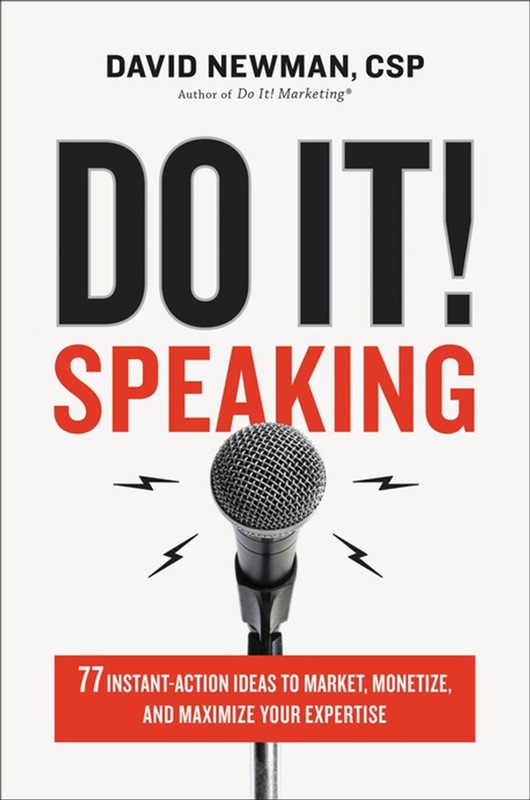 Speaking in Epub: dopo aver letto l’ebook Do It! Speaking di Newman David ti invitiamo a lasciarci una Recensione qui sotto: sarà utile agli utenti che non abbiano ancora letto questo libro e che vogliano avere delle opinioni altrui. L’opinione su di un libro è molto soggettiva e per questo leggere eventuali recensioni negative non ci dovrà frenare dall’acquisto, anzi dovrà spingerci ad acquistare il libro in fretta per poter dire la nostra ed eventualmente smentire quanto commentato da altri, contribuendo ad arricchire più possibile i commenti e dare sempre più spunti di confronto al pubblico online.